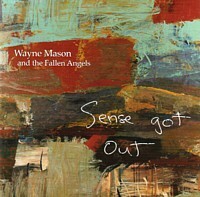 'Sense Got Out' is Wayne Mason's third album under his own name and first with his band "The Fallen Angels". The title song "Sense Got Out" was a finalist in the prestigious US based International Songwriting Competition 2006, judged by some of the top musicians in the world. Mason's songs explore the unloved, the unrequited romance, the tensions and the journey along the way....it's not all about happy endings. And then again, sometimes it is. Songs like "Last Dance (For Dreams and Hopes) and "Centreline", wistful and hopeful, a world full of possbilities. And "Plates" completes the album. It's a restful place, an ending for some, and a beginning for others.